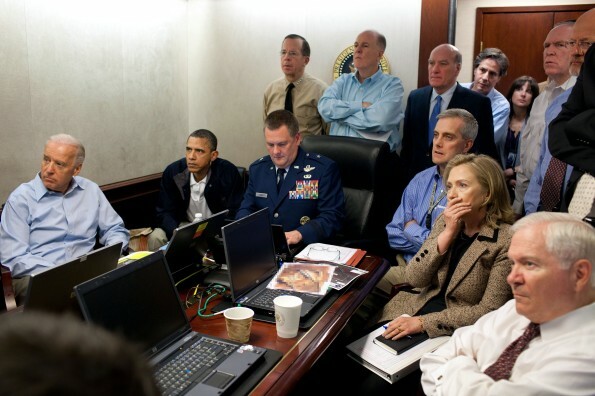 Faces of apprehension in the White House Situation Room during the operation to capture or kill Osama bin Laden near Abbottabad, Pakistan. In the photograph provided by the White House, President Barack Obama, and Vice President Joe Biden shown on the left; Chairman Joint Chiefs of Staff Mike Mullen stands behind the president; National Security Advisor Tom Donilon stands next to Mullen; White House Chief of Staff William M. Daley stands next to Donilon; Deputy National Security Advisor John O. Brennan stands next to Daley; Director of National Intelligence James R. Clapper stands next to Brennan; Defense Secretary Robert Gates sits next to Secretary of State Hillary Clinton. Other members of the National Security team not yet identified in the photo. The U.S. is releasing more details on the raid and firefight that killed Osama bin Laden in a luxury Pakistani compound, and on his burial in the North Arabian Sea. “Geronimo” was the operational name for the target Osama bin Laden. The National Security team members were relieved when a Navy SEAL transmitted a coded message to the White House Situation Room “Geronimo-E KIA” — “E” for ENEMY and KIA for KILLED IN ACTION. Bin Laden was shot twice, once in the head and once in the chest after hiding behind a woman. The operation sent two teams of 12 NAVY SEALS in for a drop from Blackhawk helicopters to a walled compound in Abbotabad, Pakistan.